We are a leading Manufacturer of rain test chambers from Thane, India. 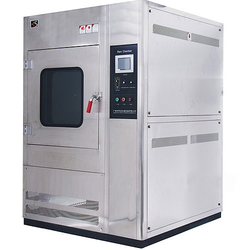 These Rain Test Chambers are manufactured under the supervision of experienced professionals, who strictly follow the established norms and standards of the industry. In addition to this, We are instrumental in manufacturing and supplying superior quality Rain Test Chambers. we also offer these products in customized range, so as to fulfill the requirements of the patrons. Our professionals make sure that these products are delivered to the customer's place within the promised time period and safely.